I only have one thing to say: it's about freakin' time. Your Minnesota Twins defeated the New York Yankees 8-2 last night, their first regular-season win over the Bronx Bombers since May 10, 2001. For the sake of amusement (and to see just how far this franchise has really come), let's compare these two victories, which were separated by a mere three years, three months, and seven days (1195 days total). The Twins featured a lineup that had Christian Guzman leading off, Matt Lawton batting third, Chad Allen batting sixth, and the ever-fearsome Jason Maxwell starting in the DH slot (he would be replaced by the just-as-fearsome Denny Hocking later in the game). Mark Redman started for the Twins and pitched well in his matchup with Andy Pettitte. The Twins of 2004 decided to throw everything they had against the Yanks. Newcomers into the lineup were Shannon Stewart, Lew Ford, Justin Morneau, and Henry Blanco. Radke started against the Yankees' new ace, Javier Vazquez. The Twins played their patented version of small-ball, scratching out 4 runs in the first 4 innings against Pettitte. A.J. went 3-4 and scored twice, and Allen had a key run-scoring triple. Dougie Baseball went 2-3 with 2 RBIs, including the game-winner in the 10th against Mariano Rivera. Mientkiewicz drove in Guzman who had stolen second to get into scoring position. LaTroy (remember now, this is before his second-half meltdown) pitched a scoreless 10th to earn his 11th save and the Twins won the series in New York. Brad Radke pitched seven innings of outstanding baseball, squashing a big Yankee threat in the seventh. Koskie and Morneau hit mammoth home runs in the second and third innings, respectively. Stewart (wouldn't he have been nice to have back in 2001?) went 3-4 and started two key Twins rallies. Hunter even pulled a Chad Allen with his steal of second in the fifth, taking off when the pitcher had barely toed the rubber (the steal also ended Vazquez's no-steal streak at 225 2/3 innings). 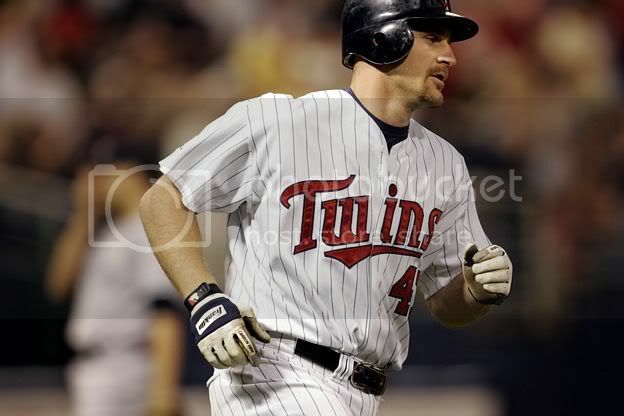 Juan Rincon and J.C. Romero, neither important members of that 2001 team, escaped jams of their own in the 8th and 9th as the Twins held on for the victory. Just a little bit of interesting information there. I guess it's true what they always say: the more things change, the more they stay the same. Yesterday's win was a big one for the Twins, and it should hopefully do a lot for their confidence as they head into one of the tougher parts of their schedule. The lightning in Corey Koskie's bat was not lost during the flight from Cleveland, which is extremely encouraging (as I mentioned yesterday). I also must say that Justin Morneau's homer was one of the most impressive sights I've seen all season. When Posada called for that cutter (or whatever that pitch was) I just knew Morneau was going send that baseball on the ride of its life. I am very excited for tonight's game, featuring the pitching matchup of Santana versus Mussina. I have two of the best seats in the house (18 rows up from the visitor's dugout right on the aisle) for one of the biggest games of the year, and I can't wait. Plus, it's Twingo and Dollar-a-Dog night! What more could a guy ask for? Because I'll be at the game until rather late, I may or may not have a new post up tomorrow, so consider yourself forewarned. Thanks for stopping by Twins Chatter and come on back right soon, ya hear?